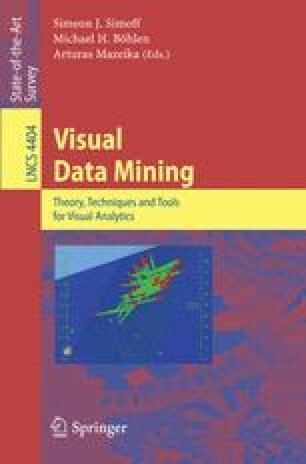 As discussed in Part 1 of the book in chapter “Form-Semantics-Function – A Framework for Designing Visualisation Models for Visual Data Mining” the development of consistent visualisation techniques requires systematic approach related to the tasks of the visual data mining process. Chapter “Visual discovery of network patterns of interaction between attributes” presents a methodology based on viewing visual data mining as a “reflection-in-action” process. This chapter follows the same perspective and focuses on the subjective bias that may appear in visual data mining. The work is motivated by the fact that visual, though very attractive, means also subjective, and non-experts are often left to utilise visualisation methods (as an understandable alternative to the highly complex statistical approaches) without the ability to understand their applicability and limitations. The chapter presents two strategies addressing the subjective bias: “guided cognition” and “validated cognition”, which result in two types of visual data mining techniques: interaction with visual data representations, mediated by statistical techniques, and validation of the hypotheses coming as an output of the visual analysis through another analytics method, respectively.